You’ve filled out your brackets and now you are ready for one of America’s most popular sporting events. But what if you are you stuck at work or away from your TV? Or your local affiliate is showing a different game? Today we show how to catch all the March Madness online. 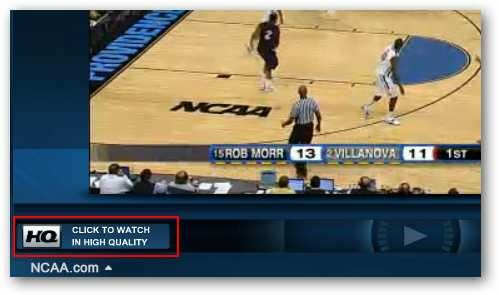 Check the “Watch in High Quality” section to see if your browser is ready and compatible for the High Quality viewer. Or that you need to install Silverlight. To install Silverlight, click on the “Get HQ” button and follow the prompts to download and install Silverlight. To launch the player, click the large red “Launch Player” button. At the top of the screen, you’ll see the current and upcoming games. Click on “Watch Now” below to begin watching. At the bottom left, is where you click to watch with the High Quality player. 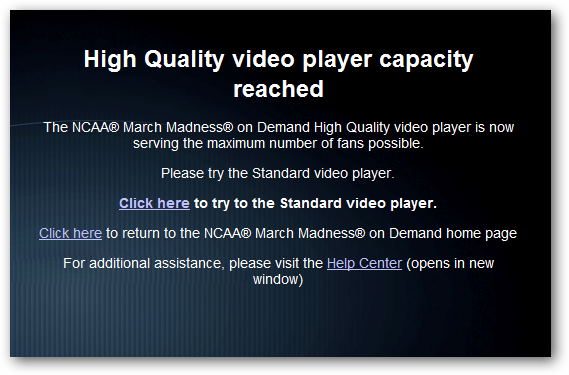 If to many people are watching the High Quality player, you’ll see the following message and have to go back to the Standard Player. At the lower right are volume controls, a “Full Screen” button, and a “Share” button which allows you to share the game you are watching on various social networking sites like Facebook and Twitter. Perhaps most importantly for those who want to steal a bit of viewing time while at work is the “Boss Button” at the top right. 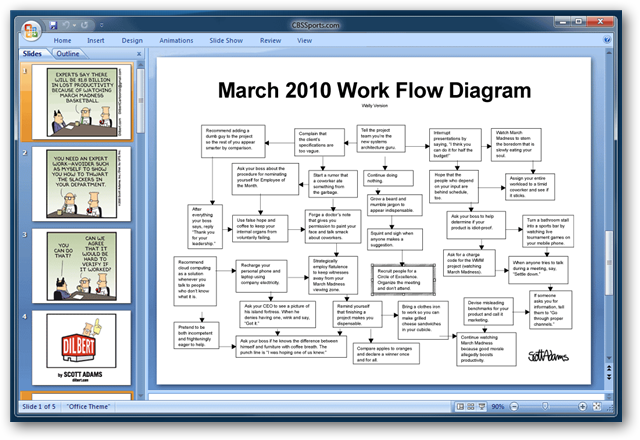 Clicking on the “Boss Button” will open a fake Office document so it may appear at first glance like you’re actually doing legitimate work. To return to the game, click anywhere on the screen with your mouse. 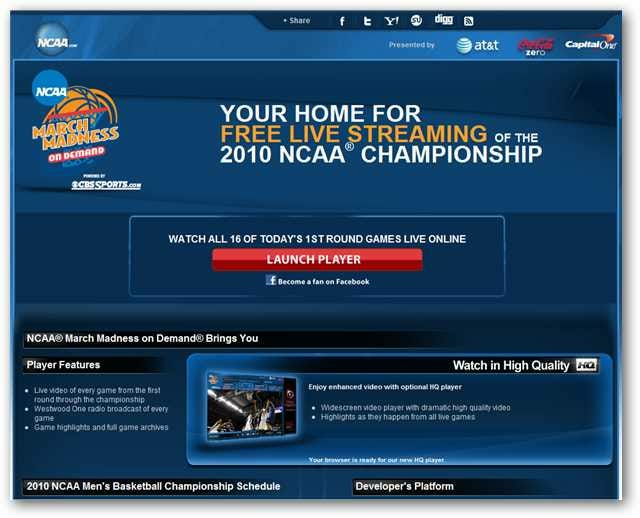 You’ll be able to catch every single game of the tournament from the first round all the way through the championship with March Madness on Demand. 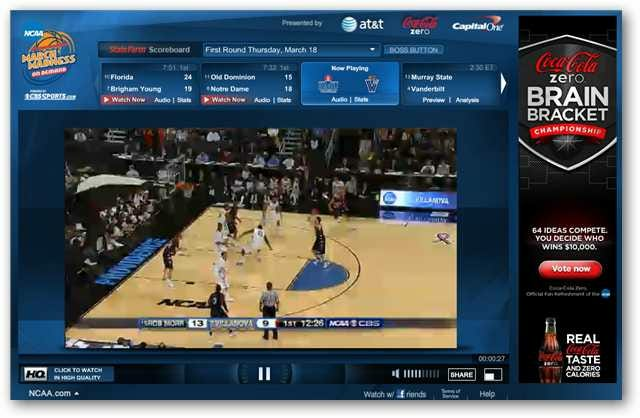 If your computer and Internet connection can handle it, you can even watch multiple games at the same time by opening March Madness on Demand in multiple browser windows.